You can read the original interview in the website of the Ministry of Reconstruction of Production, Environment & Energy, here. The interview was given to newspaper “ΚΕΦΑΛΑΙΟ,” and specifically to journalist Niki Zormpas. Below, you can find my translation of the interview in English. 1. Minister, what aftertaste did the visit of the Prime Minister to Berlin leave you with? LAFAZANIS: The meeting of Alexis Tsipras with Angela Merkel at Berlin ought to have happened, and it is positive that from the Greek side some crucial problems for Greece were highlighted face-to-face. Beyond that, however, I do not think that the official Germany is changing its strategy. Quite the contrary, I would say. Today, it becomes even more evident to me that the pathway of the country away from the crisis goes through tough confrontation, if not collision, with the Germanized Europe. The current Germanized establishment, despite its internal differences, is the most devastating thing for Greece, and more comprehensively, for the entire European continent. The sooner this becomes realized in practice, the better. Because, there is no time. We have no more time. 2. Are you more, or less, worried after the “melting” of the ice between Greece – Germany? LAFAZANIS: A lot needs to be done by the German side in order for us to speak seriously about “melting” of ice between Greece, and the Germany of Merkel and Schäuble. Greece is situated at a breaking point. At this hour what is required for the country, urgently and without any delay, are big and bold choices, alternatives to the Germanized Europe. The Germanized and established EU is literally suffocating our country, tightening the noose on the neck of the economy week by week. 3. Do you have an image of the list of reforms that Greece is going to bring to the “institutions” on Monday? How do you assess them? LAFAZANIS: At this hour, the government is preparing the “list” towards our “partners.” It is a very painful process. What I can say at this time is that the list should not be in contrast to our radical program, and it should not put it “on the freezer” either. No “list” can be provided, and will not be provided, that is above the will of the people and popular sovereignty. 4. From how things look, however, the government is “saying farewell” to the Thessaloniki program – at least for now. LAFAZANIS: We do not abandon the Thessaloniki program, or our comprehensive radical program. Already with the first draft bills, which have become laws in the Parliament, we are moving towards the direction of those programs. No “institution”, no blackmailing and no dilemma is going to bury the decade-long struggles of the executive members of SYRIZA, which were given together with the Left and its principles. SYRIZA is not going to be absorbed by the state, and will not become a crutch and manager of the neoliberal “state-fed” Greek capitalism. The soul of SYRIZA is the society and the need for a progressive reconstruction of the country with a socialist horizon. 5. Does the “freezing” of the pre-electoral announcements of SYRIZA, in order for the country to overcome the ‘Symplegades stones’ of the economic suffocation, seem appropriate to you? LAFAZANIS: The need for liquidity is the most crucial and urgent problem of the Greek economy. Without liquidity there is no way out. The prevailing circles of the EU, especially in Berlin, are extorting the country in raw, having cut for quite some time now the flow of financing. It is a dirty plan that was implemented in Cyprus with an ultimatum of one week, while in Greece they are following a more prolonged (time-wise), but also more tormenting, version of it. In any case, their behavior looks more like that of ruthless imperialists towards their far-off colony. They are forgetting, however, that this knife, which they are using, cuts from both its sides. Greece is not going to be lost with economic strangulation, nor will it suffer [heart] failure from the economic suffocation. Greece has many viable and realistic alternative ways in order to react – and in fact react successfully. Greece is a small country to be making any threats, but it is certain that our country has the possibilities of multiple choices, while those that are threatening it are following only one, very problematic and quite dangerous [choice] for their own sake. If we freeze our pre-electoral proclamations – which we are not going to “freeze” – not only will we not exit the Symplegades stones, but it is then that we will be moving directly towards the cliff. LAFAZANIS: The “realpolitik” for our government is one and one only: to remain committed and implement our radical program. The only road that is offered to us by the “institutions” does not contain the slightest realism, has been tried [in the past] and failed miserably. Tsipras, and Lafazanis, and all of us in SYRIZA have only one mandate and only one choice: to go forward with our principles, our values and our program, resting on the better historical traditions and social struggles. The only realism at these critical moments we live in is the overturn. 7. The scenarios of one ‘all-party government,’ or a coalition government, have flared up recently. And these scenarios are attributed to your own unwillingness to support the “difficult” measures. I would like your comment on that. 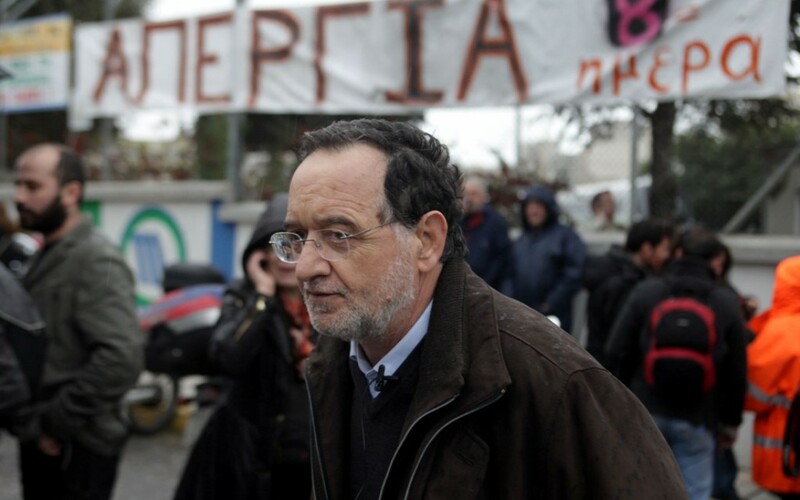 LAFAZANIS: There is already a coalition government between SYRIZA and ANEL [Independent Greeks]. Beyond that, any potential ‘all-party government’ in which To Potami, PASOK, and New Democracy would be involved, would in essence be nothing else than a government vassal to Germany, which would follow even more horrible pro-Memorandum roads. The dilemma “difficult” measures from SYRIZA, or ‘all-party’ government is absolutely spurious! SYRIZA has no other choice than [implementing] its program, which can unite and rally the vast majority of the Greek people. 8. Your portfolio is the fundamental “cogwheel” of the privatizations, which our lenders seemingly seek and the government is [seemingly] examining. How will you deal with such a possibility? LAFAZANIS: Privatizations in our country, and especially in strategic areas and public property of particular importance, must not and will not occur. I know very well that domestic interests and exceptional foreign centers have been “raging” with DEI [Public Power Corporation S.A. – Hellas] and want to chop it, dissolve it, and put it in [their] hand. A privatization of DEI and of its group companies would be a complete disaster for the country. Greece cannot survive without its heart. Our country, on the contrary, needs a reconstruction of its public strategic areas as a prerequisite of a breath of air and way out [of the crisis]. 9. To the dilemma “Rupture, exit from the Eurozone and default of the country, or honorable compromise with the EU,” what do you answer? LAFAZANIS: The dilemma posed by the creditors to our country is insubordination, or economic suffocation. This dilemma, however, is misleading, counterfeit, coercive, and humiliating. This is why we absolutely reject it. Greece, as I have already mentioned, has many alternative progressive roads to choose from. These roads, against the domestic and European vested [interests] might seem difficult, but they are the only viable, realistic, and promising ones. Thank you very much, this is interesting. In Ireland/UK, we see almost nothing about the internal debate in Greece. Efcharisto poly! It is beyond belief, that this man really thinks, Greece was “entitled” to continued European funding. Pingback: LabourNet Germany: Treffpunkt für Ungehorsame, mit und ohne Job, basisnah, gesellschaftskritisch » Luft zum Atmen unter der Syriza-Regierung – wie lange noch?